An open source modelling toolkit to create ArchiMate models and sketches. 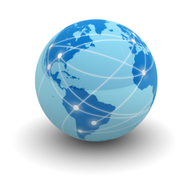 Used by thousands of Enterprise Architects throughout the world. The Archi® modelling toolkit is targeted toward all levels of Enterprise Architects and Modellers. It provides a low cost to entry solution to users who may be making their first steps in the ArchiMate modelling language, or who are looking for an open source, cross-platform ArchiMate modelling tool for their company or institution and wish to engage with the language within a TOGAF® or other Enterprise Architecture framework. 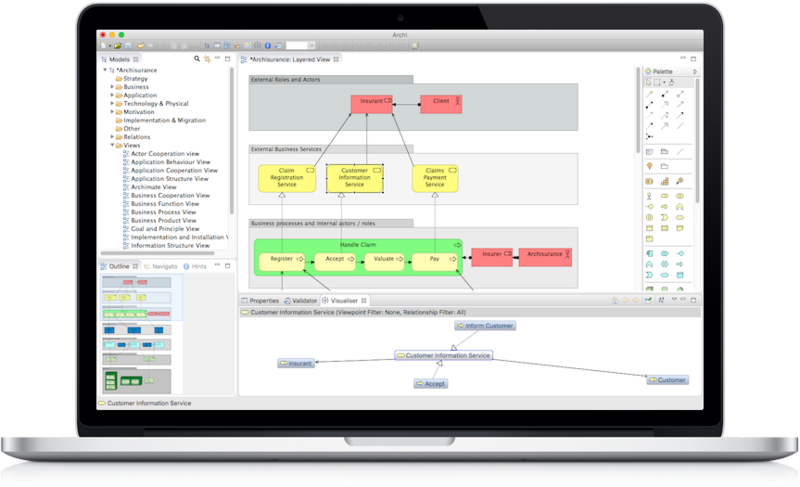 The ArchiMate® modelling language is an open and independent Enterprise Architecture standard that supports the description, analysis and visualisation of architecture within and across business domains. ArchiMate is one of the open standards hosted by The Open Group® and is fully aligned with TOGAF®. 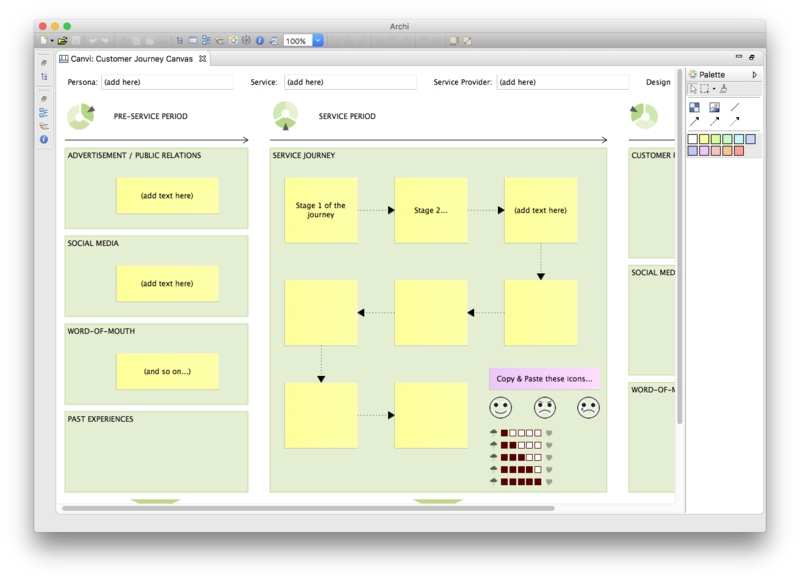 ArchiMate aids stakeholders in assessing the impact of design choices and changes. Archi® fulfils the needs of most Enterprise Architects and associated stakeholders, and has been designed to elegantly provide the main features required for ArchiMate modelling and is used globally by banks, insurance companies, industry, EA consultants, training organisations, universities, and students. It is the world’s most popular ArchiMate modelling tool and is downloaded between two and three thousand times every month. Archi 4 is available. This latest release of Archi supports the latest version of the ArchiMate language – ArchiMate 3. It also includes the ability to exchange models using latest version of The Open Group’s ArchiMate Exchange format. The exchange format means that you can migrate your models from and to different ArchiMate tools and work with the XML data with other frameworks. 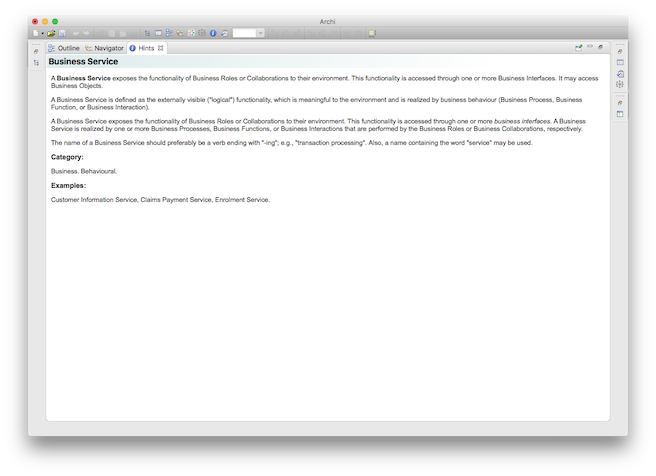 This release also contains fixes, and some improvements to reporting and the Visualiser. If you find Archi useful in your work and you’d like to help us maintain Archi, a donation would be most welcome, and we accept PayPal, or you could become a patron on Patreon. All development work and support is done for free. A small donation would be much appreciated! The Archi® modeller is targeted toward all levels of Enterprise Architects and Enterprise Modellers. 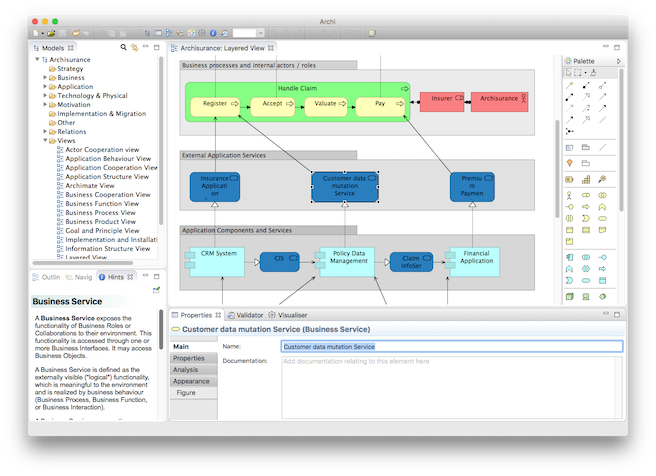 It offers an open source software solution to modellers who may be making their first steps in the ArchiMate language. Easily and intuitively create all ArchiMate elements and relations in all of the ArchiMate views. Use the magic connector to create the right connections. 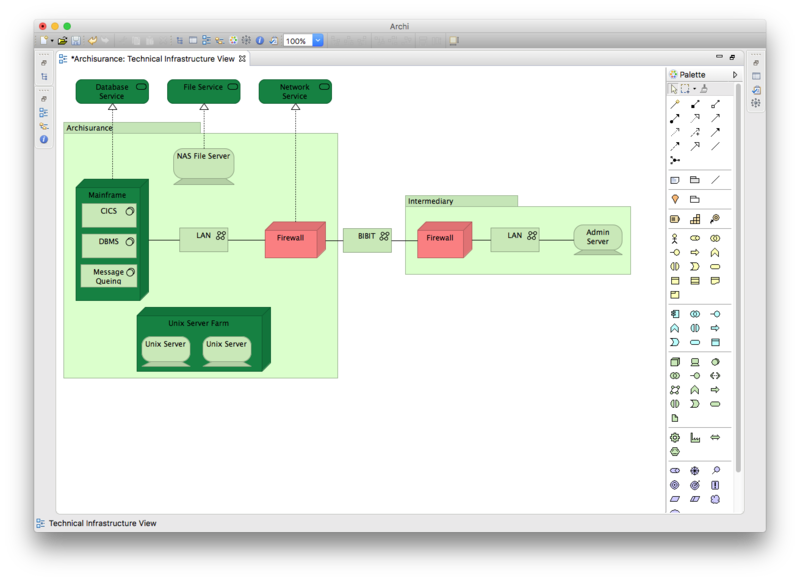 Refine your model with user-defined properties, and colourise your diagram with your own colour scheme. Dynamic Viewpoints let you change the ArchiMate Viewpoint at any time. Any elements that are not permitted for that Viewpoint are “ghosted” out or hidden. Dynamic Viewpoints allow you to change your mind. You don’t have to decide up-front what the Viewpoint will be. You can experiment with different Viewpoints for the same View. And if you decide to keep the Viewpoint, you can simply remove any disallowed elements from the View. You could even set up one master View and apply different Viewpoints in a “what if” scenario. If you’re not sure what element to use, or what relationship to connect, simply fire up the Hints view. All ArchiMate elements, relationships and viewpoints are described to provide you with the right information at your fingertips, just when you need it. 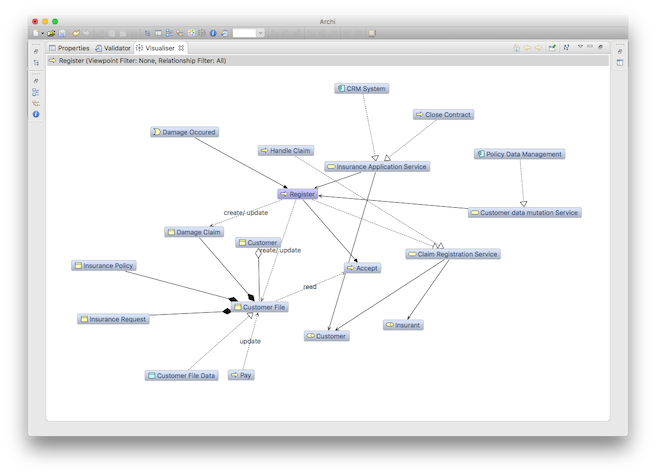 The Visualiser displays the selected model element and all of its relationships with other model elements in a radial-tree graphic. It is the graphical equivalent of the Navigator. Selecting an element or relationship in the Model Tree, the Navigator or in a Diagram View will update the selection in the Visualiser. Drill in to see more connections. Windows, Mac or Linux? We’ve got you covered. 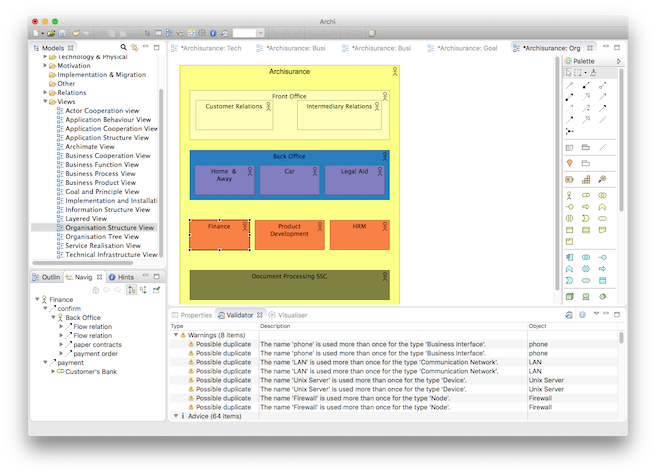 Archi is fully cross-platform as it is written in Java on the Eclipse Rich Client Platform. Therefore it works on Windows 7, 8 and 10, Mac OS X, and most Linux distros right out of the box. You don’t have to worry about sharing models across installations. A portable version and an installer version is available for Windows. Brainstorm your ideas with elements written on “stickies”. Quickly design and create “soft” models, capturing the essence of your modelling process without worrying about the technicalities of the language. 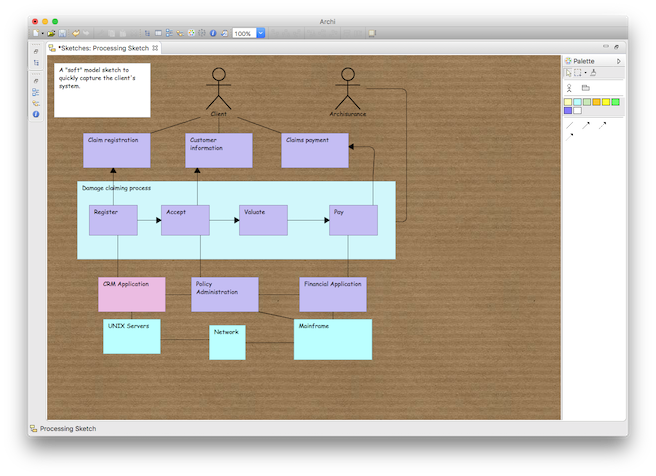 Share and refine your ideas before transforming them to ArchiMate views. Create your own canvas world. The Canvas Modelling Toolkit provides the tools for you to create and edit your own canvasses. With the Canvas Modelling Toolkit you can design and create re-usable Canvas Templates to share with colleagues or you use it as a pre-design tool to sketch out ideas and models.